New reports issued by National Academy of Sciences (USA) in response to a request by Congress state that the science of climate change has been established well enough to be accepted as fact. This echoes other recent statements from the science community. They also support the IPCC findings that human emissions are very likely the cause (don’t see why they need the “very likely” – in my opinion its certain). 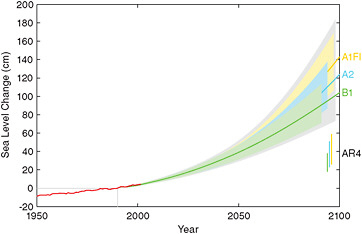 However, the amount of actual sea level rise we will experience will vary somewhat from place place around the globe. Large uncertainties still exist as to the actual amount. The range of 0.8m to 2m is still under discussion with various papers giving different ranges based on different approaches. What they all agree on is that sea level rise will be dramatic (for our coastal settlements and low-lying lands) and will continue to accelerate into the future. Even if we mange to get an international agreement into place, the sea will rise for many centuries. If we don’t the rise will be much greater in magnitude and will continue for thousands of years. The NAS plan to issue a report on the impacts for different magnitudes of future climate change.